The Big Idaho Potato Truck is pretty impressive in person and parked at an event but it really messes with people when they pass us on the road! I have the top bunk this year with windows on three sides and get to watch peoples confused expressions as we drive by, then watch them scramble for their phones to take a picture. This year we got an addition to the truck that makes our long drives and fuel stops so much more fun….that’s right a CB Radio. Somebody on the CB cracks us up nearly everyday and I wish we could record it for ya’ll to hear. Not only are there heated discussions amongst other truck drivers about the “realness” of the potato but also financial and life advice. We did have some really fun events to break up the driving. 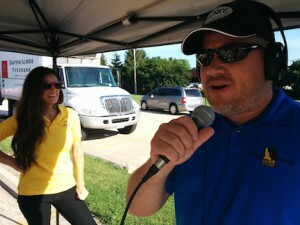 A couple radio DJ’s at WDWS in Champaign, IL heard about the truck and wondered if they might be able to request it in the future. They reached out to tater central in Idaho and it turned out that we were going to be at an event just a few hours away in a couple weeks and we could stop there if they could pull something together in time. Mike from the station took the reigns and they put together an awesome food drive with an amazing turnout from their community! I don’t think I’ve ever met such polite people. 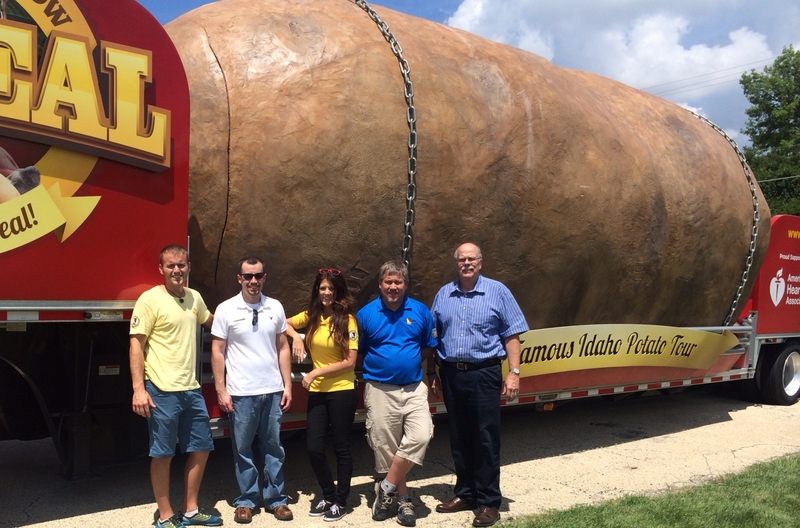 And here’s a fun fact that we discovered as we met people at the event – our very own Cherylann Scofield of Scofield Design that built the potato is from Champaign! 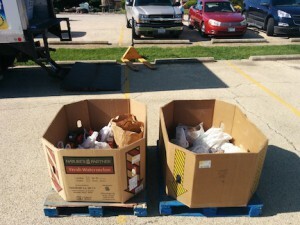 After the food drive we headed to Macomb, IL for the Macomb Heritage Days. It’s a quaint little town that comes together each year for the festivities and this years theme was ‘A tribute to our military.’ The potato was a big hit and people were able to fill their cravings after seeing it and the nearby Elks booth where they were serving up baked potatoes with all the fixins. We met a bunch of lovely people there and had great conversations with them. It really is the people who make our job so great so if you happen to see us on the road or we come to your town please come say hi and snap a picture, you’ll make our day.